The New Angel is the latest restaurant from Michelin-starred chef, author and restaurateur John Burton-Race, and is his first London restaurant after an absence of 12 years. The New Angel is set in a converted Victorian pub on Chepstow Place, in Notting Hill, and is neighbour to another well-known London establishment, Assaggi. The New Angel opened in April 2014, and within its first year of opening it was awarded three AA Rosettes and recognised by Harden’s as one of its Top 10 new openings of 2015. John Burton-Race has a long string of Michelin credits to his name, starting with Le Manoir aux Quat’Saisons where he worked with the renowned chef Raymond Blanc from 1983. In 1986 John opened his own restaurant, L’Ortolan in Berkshire which went on to win two Michelin stars, a feat John repeated in 2000 with his restaurant at John Burton-Race at the Landmark Hotel. John then sojourned to France for a number of years before returning to the UK in 2004, opening The New Angel in Dartmouth, Devon. This restaurant also attained a Michelin star in 2005, an achievement the restaurant retained until John’s departure in 2010. With The New Angel Notting Hill, John seeks to replicate the French inspired contemporary European cooking for which he is so well known. The restaurant is classically decorated and oozes with warmth and elegance. 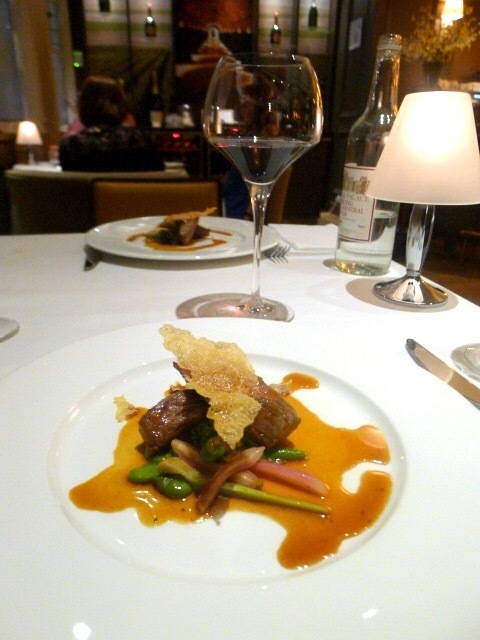 Rounding off the fine dining experience is a comprehensive wine list and an experienced team of waiting staff. 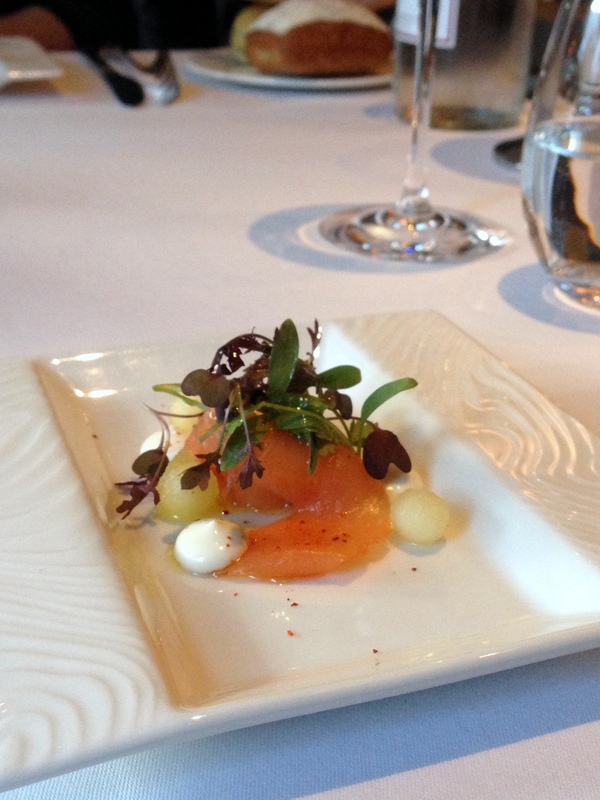 We chose the tasting menu (£77) with pairing wines (£137) which kicked off with an amuse bouche of salmon gravalax with a lime and horseradish cream and some vanilla apples which was heavenly. The combination of the acidity from the lime, the sharpness of the horseradish and the sweetness of the apples was perfect judged and added a touch of magic to the delicious salmon. It was a small plate of food, but a truly delicious one at that. The bread selection was gorgeous and consisted of olive, pain de campagne, French baguette, chorizo with parmesan and brown sourdough. 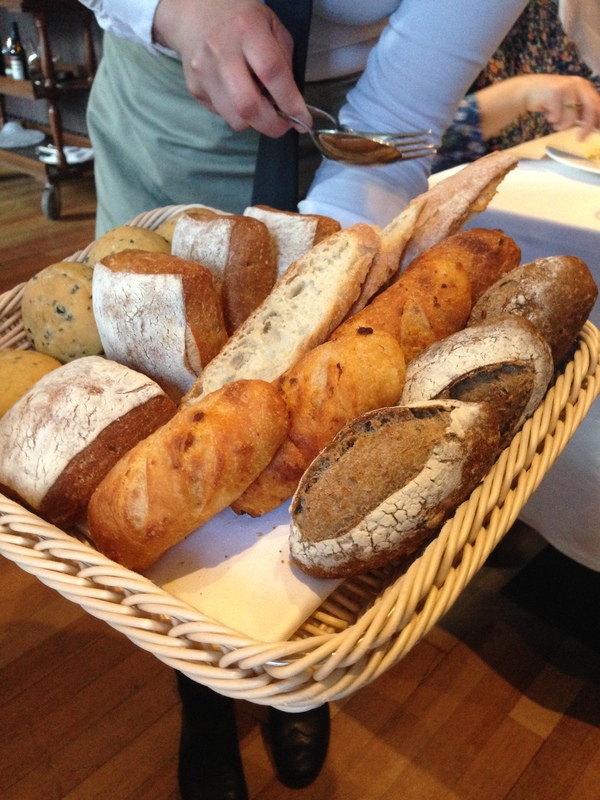 All the breads were well made with good crusts, soft interiors and very tasty. The first course was a celery and golden beetroot bavarois with a comte cheese and walnut dressing. This dish was divine, with the creamy bavarois being both savoury from the celery and sweet from the beetroot. The dressing was well made with a lovely, robust depth of flavour whilst maintain an air of delicacy and lightness. Together the two was a marriage made in heaven. Other enjoyable touches included some beetroot puree and some wonderful shimeji mushrooms. The wine was a 2013 Corbières, Château la Bastide, Languedoc-Roussillon, France, which with its crisp, clean taste, worked nicely with the dish. Wonderful slivers of Dutch veal carpaccio with shavings of frozen foie gras were tender and tasty. A delightfully fragrant tarragon mayonnaise dressed the veal and was a perfect match for the deliciousness of the meat. To complete the dish were some smoked sturgeon and Oscietra caviar salt, both of which were exciting on the palate, but which also rendered the dish a little salty. The wine was a 2010 Riesling, ‘Heimbourg’, Zind Humbrecht, Alsace, France, which had an apple and apricot nose and a creamy palate. 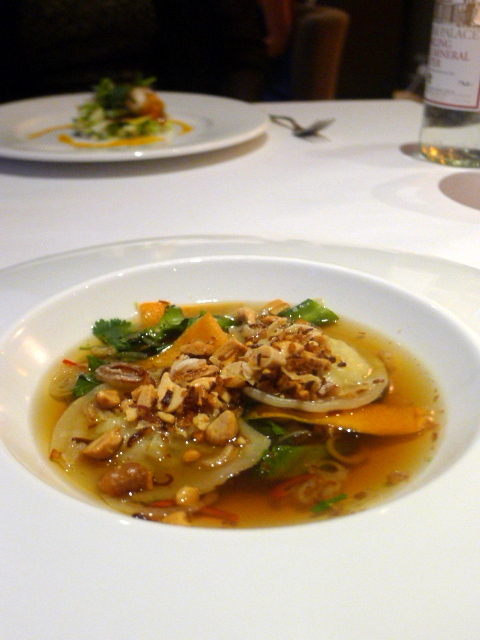 Next was an Asian spice consommé with crab wontons, baby vegetables and Thai green beans. This was the least successful course of the evening. The broth consisted of a variety of Asian spices such as ginger, chilli, garlic, and coriander. The broth was respectable, but the flavours were quite strong and it had the effect of overpowering the delicate flavour of the crab. The wonton pastry was also a little too thick. 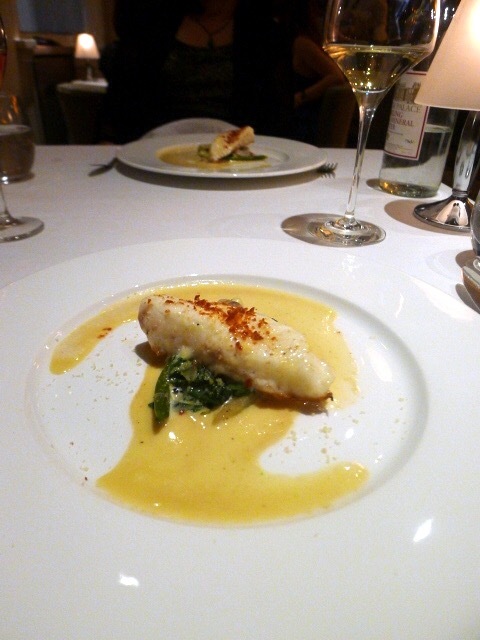 Devon turbot with fine de Claire oyster, fennel and a Monbazillac foam provided a mesmerising explosion of flavours. The fish was nicely cooked and the oyster was rich with flavour. But it was the foam that stole the show. The use of Monbazillac was a considered choice as it offered up a delicate sweetness, and texturally it contained a wonderful lightness that complemented the fish beautifully. The wine was a 2008 Harslevelu ‘Kiraly’, Szepsy Pinceszet, Tokaj, Hungary, a dry wine with lots of character. Roast fillet of Southwest lamb was cooked to a lovely pink colour and was tender and tasty. 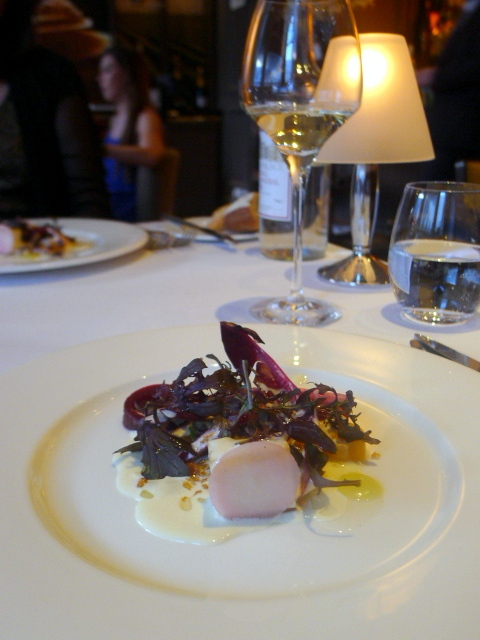 Accompaniments of wild garlic and baby violet artichoke were nicely done and added an earthy complexion to the dish. To round of the dish was flavoursome lamb jus. The wine was a 2010 ‘Numanthia’, Bodegas Numanthia, Toro, Spain, a drop with a lively character, elegant aromas and fruity notes. The pre-dessert was vanilla parfait with rhubarb and a tonka foam which we really enjoyed. 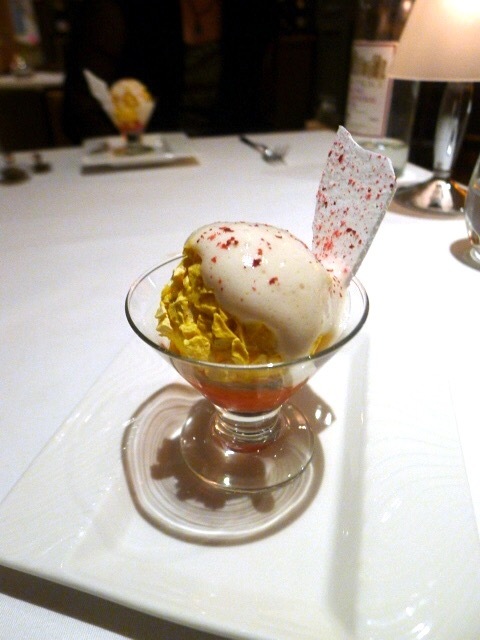 The contrast between the sharpness of the rhubarb and the creamy sweetness of the parfait was lovely. The use of tonka added another dimension to the pre-dessert. Dessert was a lemon soufflé with macadamia nut caramel and salted white chocolate ice cream which was a joy to behold. 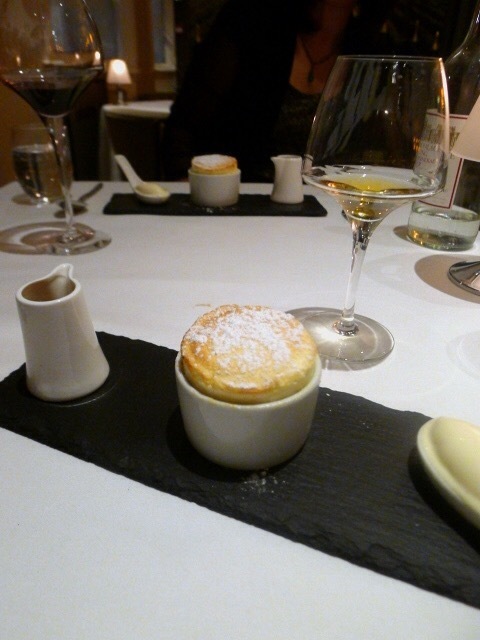 The soufflé was fluffy with a lemony tinge and extremely well made. The sweetness of the caramel and the saltiness of the ice cream were great pairings for the soufflé and all three elements came together beautifully. The wine was a 2009 Pacheranc Molleux, Chateau Bouscassé, Madiran, France, an aromatic wine with a light sweetness and rich acidity that elevated the sweetness of the dessert. The New Angel offers a delightfully creative menu to be admired for its exciting combination of textures and flavours and delicacy of touch. It’s refined and skillful cooking, and together with the comprehensive wine list and very friendly and knowledgeable staff, The New Angel proved to be a stellar dining experience. 1) The food was delicious on the whole, but particular favourites included the gravalax amuse bouche, the celery and comte cheese course, the turbot with Monbazillac foam and the lemon souffle. 3) The strong wine list. 1) The Asian consommé with crab wontons. The tasting menu is £77 and £137 with matching wine. From the a la carte menu, 2 courses is £46 and 3 courses is £56. From the lunch menu, 2 courses is £28 and 3 courses is £34.